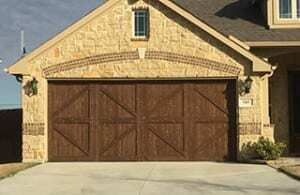 Whether you had a fresh, beautiful new garage door installed or you want to take care of an existing fixture, wooden doors need special care. Fortunately, the labor involved in garage door care is relatively light and easy; you just need to know a few tips for getting the most life out of your door. The first step in regular maintenance is to inspect the wood. You should check for pests (such as termites), signs of rot ,and places where the wood is chipped or cracked. If you find rot or pests, you should consider professional care for the wood. If you only have chips and cracks, then DIY is perfectly acceptable. To fix cracks, carefully remove the splintered wood. Then, lightly sand the newly exposed wood. This will create a smoother surface that is better protected against the invasion of water and invaders. Once your surface is smooth, you can move on to step two. It’s important to have a clean wood surface. While water is typically an enemy, that only applies to prolonged exposure. Regular soap and water are fine for cleaning your wooden door, but avoid abrasive scrubbers. You don’t want to remove your finish while you clean. Instead, a regular cloth or sponge should do fine. Clean the interior and exterior of the wood and thoroughly remove dirt, dust, and other buildup. Once cleaned, allow the door to dry before going to the third step. Your door should already have a finish on it, but each time you perform basic maintenance you should add a fresh coat. It is important to seal the newly exposed areas that you already serviced. It’s also important to remember to seal the interior and exterior. One of the biggest killers of wooden doors is interior neglect, but they are exposed to the same temperature and humidity changes that batter the exterior. Once the wood is sealed, you are done with this part of maintenance. There are still a few things to consider with the door mechanisms. Wooden doors operate with the same machinery as any other door, and inspecting and caring for these parts is universal. Ultimately, you want to make sure the safety features are working, check the tracks for warping and debris and lubricate the moving parts. You can find more detailed instructions for these tips here. Those are the basics, and it’s a pretty simple process. For those of you who love the nitpicking details, you can get a glimpse of commercial maintenance expectations. Now that you have a healthy and gorgeous garage door, you can move on to your next home improvement project! Or, take a break. You earned it.